Thanks for marching with us! Thanks to the up to half a million who marched in Central London today. A huge turnout from many trade unions and community organisations meant the march ran for five hours – a solid swathe of marchers from Blackfriars to Hyde Park – with people travelling from all over the country. The first coaches left last night in order to get here, and people will be a long time getting home – a real committment! This will send a strong signal to the government that those opposing their fast and deep public spending cuts are not an easily ignored minority. In fact, as YouGov showed today, we’re now the mainstream majority. Big as today was, it is only one step in a larger campaign, and there will be a lot to fight for in coming months. 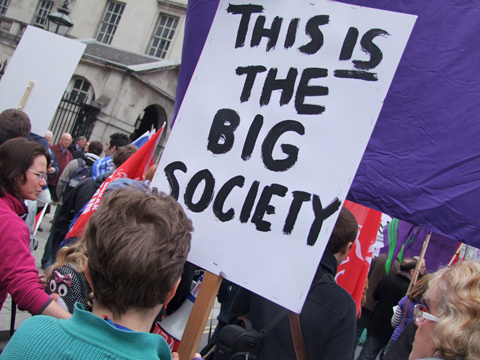 Check out False Economy’s listings of anti-cuts groups and actions near you, to see what’s going on in your own area. And look out for 1st April : All Together for the NHS Day, when we’re stepping up the lobbying of MPs against cuts in the NHS. I am a young folksinger, I wrote many protest songs against the system and society. I’ve always wanted to sing in one of the rallys in london. have you got any dates? My family and I, from my 74 year old mother who had never before made a political statement to my 17 year old daughter who has now to choose a Welsh university (they’re not doing the stupid fees and we’ve been here over 5 years so qualified as Welsh for those purposes a couple of years ago) had the privilege of marching with you on Saturday. We all thank you for the excellent organisation. I can only urge England to regionalise now. Our Welsh Assembly Government protects us from many of the ConDem cuts and earlier this month we voted to distance ourselves further from Westminster where we could. I would also urge a headcount of those attending on Saturday if that’s possible. It is in the interests of “the authourities” to minimise numbers, maximise trouble in order that future events are discouraged: few cared and those who did, did damage! That’s what the press say. Far from the case! I KNOW there were half a million there, less than 600 did damage or were dangerous, yet what was reported? By the time we got home, listening to BBC reports on the radio, we thought we’d attended quite a different event! It was a wonderful day, superb organisation, great camaraderie and, again, a privilege to be counted, just let’s make sure the counting is fair! See you next time then brothers and sisters!